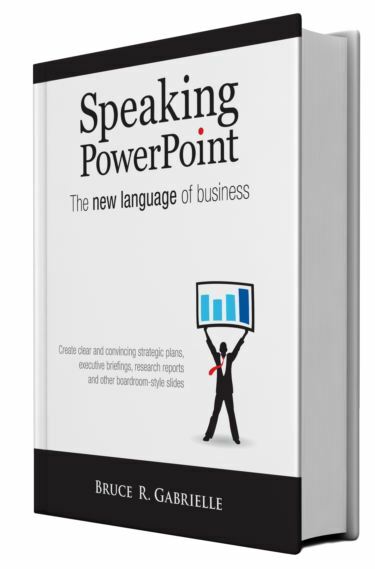 Create clear and convincing internal communications, strategic plans, research reports and other boardroom-style slides. Before you begin planning your slide deck – before you even open PowerPoint – ask yourself: who is the reader of this slide deck? And what is the question they have on their mind that they want this slide deck to answer? Now answer this question briefly. The answer you provide is the point you are going to make in the deck. Try to answer this question as early as possible in the deck. Do not “build up” to it by showing your analysis step by step. Executives hate that. They get impatient by slide 3 and start asking questions. It is better, instead, to answer the question on slide one. Then they can start asking questions like “why do you say that?”, which of course allows you to proceed to your next slide and answer their question. Too many slide decks are created without a clear message. Instead, they contain slide after slide of charts, tables, schematic diagrams and text. The presenter shares all their data but never has a clear message. The reader or listener becomes impatient, waiting for the presenter to make a point – any point! Do not fall into this trap. Executives value people who can get to the point. If your executive walks into the meeting 20 minutes late and says “Sorry, I only have ten minutes. Can you give me the bottom line?” you should be able to go to slide one and say “There it is. This is my recommendation.” Your executive will appreciate not only your focus, but your awareness of what they needed. So, don’t begin planning your deck until you know what question you are answering.